Last Saturday my husband, a tennis fanatic, surprised me with tickets to the Agassi and McEnroe exhibition tennis match at UCLA. Unfortunately traffic made us arrive late, so we missed most of the previous celebrity doubles match between Jon Lovitz/Jim Courier and Michael Chang/Gavin Rossdale, but luckily made it perfectly on time for the Agassi/McEnroe match, which benefited the Andre Agassi Foundation for Education. The result: Agassi defeated McEnroe 6-4, 6-2, and was presented with a $200,000 check for his charity from Farmer’s Insurance. We just love going to UCLA and Westwood in general. It’s just a great atmosphere over there. The exhibition match gave us a great excuse to just leave home and kids behind and go for LA. Yeah! Andrea Agassi was fun to watch. He engaged with the audience and did his special shot between his legs and scored! 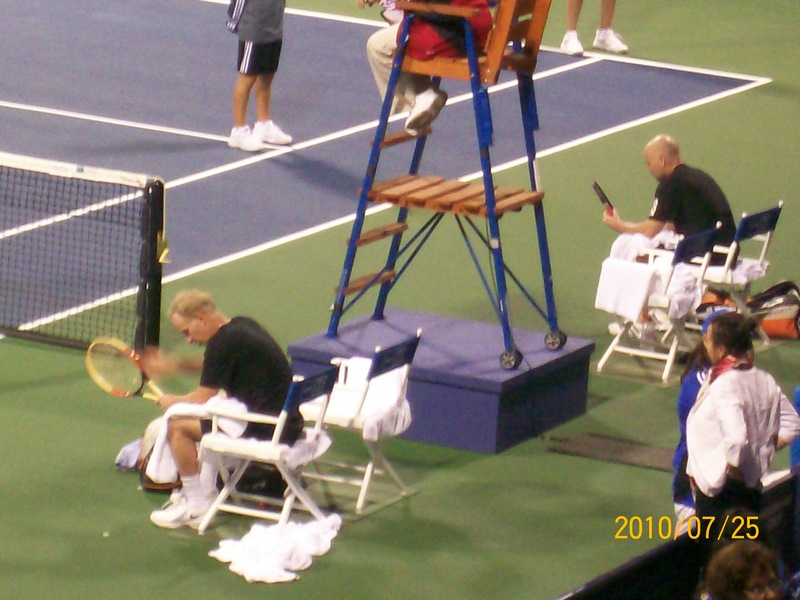 McEnroe lost his temper towards the end…. Fantastic playing from both sides! Asked by a reporter after the game where his wife Steffi Graf was, Agassi commented “…watching the children in Las Vegas”. Oh well….I hope to get a glimpse of her another time.